Heads up, business majors: Employers are newly hot on the trail of hires with liberal arts and humanities degrees. Class of 2015 graduates from those disciplines are employed at higher rates than their cohorts in the class of 2014, and starting salaries rose significantly, according to the National Association of Colleges and Employers’ annual first-destination survey of recent graduates in the workforce. Degree holders in area studies—majors like Latin American Studies and Gender Studies—logged the largest gains in full-time employment and pay, with average starting salaries rising 26% to $43,524 for the class of 2015, compared with the previous year’s graduates. Language studies posted the second-highest salary gains. with communication skills and comfort in multicultural environments, said Edwin Koc, NACE’s director of research, public policy and legislative affairs. Overall, pay for liberal arts graduates rose sharply for the class of 2015, moving closer to business graduates’ starting pay, according to Mr. Koc. “I’ll be interested to see if it’s a one-year quirk or whether it continues to boom in that direction,” he said. Those with degrees in English and in foreign languages also brought home bigger paychecks, with starting salaries rising 14.3% and 13.6%, respectively. Behind the numbers is a growing desire among employers for hires with strong communication skills, said Mr. Koc. After complaining that new hires’ soft skills are not up to par, “employers may be reconsidering how they’re approaching recruiting college graduates, and may not be so focused on hiring a particular major,” he said. Computer-science graduates posted the highest starting salaries in the survey, reporting an average of $69,214. They unseated petroleum engineering majors, who usually top starting-salary rankings but have dipped amid the energy-industry crisis. Not all liberal arts majors are enjoying boom times. History majors’ starting pay rose 3.7% year-over-year, and visual and performing arts majors were the sole group of humanities students for whom employment declined, with 2.3% fewer graduates employed six months after graduation. NACE collected employment and salary information from 279 U.S. colleges and universities and 244,000 bachelor’s degree graduates. Overall, more than 80% of 2015 bachelor’s degree holders were employed or in graduate school within six months of graduation, according to NACE. 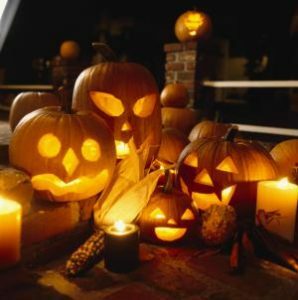 The carved pumpkins, fancy dress and Trick or Treating activities popular in North America have spread to Europe, says Dr Veronica Heath, who teaches on our 19th century European Novels module. However there are also very different traditions unique to Great Britain (such as 5th November Bonfire Night), to other European countries and to Latin America. In France, Halloween is more popular among children than adults. Dr Marjorie Gehrhardt, who teaches 20th century French history, says that since the 1990s, you can see groups of children dressed up on 31st October, going around the neighbourhood asking for sweets sometimes late into the evening as the following day is a bank holiday. On 1st November, known in France as La Toussaint [All Saints’ Day], many people take chrysanthemums to the graves of their loved ones. Traditionally the Day of the Dead is 2nd November, but this is a working day, so families tend to gather on 1st November instead. The story goes that as chrysanthemums resist well to the cold and frost, they were used to flower the graves of fallen soldiers after the First World War. Our postdoctoral researcher on Translation and NGOs, Dr Wine Tesseur explains that ‘in Belgium, families get together on 1st November and eat pancakes, waffles, and/or beignets. On 2 November, there is usually a requiem mass. If someone from your family has passed away in the previous months, a little wooden cross with their name is put on a special notice board in the local church. On 2 November, after mass, you can collect the cross and take it home’. In Austria, Halloween is more of a children’s celebration, whereas all ages celebrate Allerheiligen [All Saints’ Day]. Like in France, 1st November is a bank holiday and most people go to visit the graves of their loved ones on that day. They light white candles that sit in red glasses, and leave fresh flowers. Another tradition, our German Lektorin Elli Königshofer tells us, is for godparents to give their godchildren a striezel, a sweet pastry containing raisins, shaped into a braid (traditionally women would cut their braided hair in sign of mourning). In Italy too, people remember the dead, visit their graves and eat special food as part of Ognissanti (All Saints Day, on 1st November) and I Morti (2nd November), our language coordinator Enza Siciliano-Verruccio explains. It is the time of the year when the first caldarroste [roasted chestnuts] are eaten and many regions have their own local specialties, like the Frutta di Martorana [a fruit-shaped sweet] in Sicily. Our Spanish teaching fellow Ivan Ortega, tells us that in Spain too, people go to cemeteries to tidy up their relatives’ graves and bring fresh flowers. Spanish people also have food traditions, such as huesos de Santo and buñuelos de Viento, which are two typical sweets eaten during these festivities. In Mexico, both 31st October and 1st November are big celebrations. 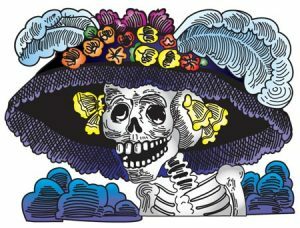 Dr Catriona McAllister, who teaches Latin American history and culture, describes Día de muertos traditions for us: ‘On 2nd November (coinciding with the Catholic festival of All Souls Day), Mexico celebrates the Day of the Dead. The festival offers the opportunity to remember and honour departed loved ones and has its origins in pre-Hispanic traditions that were later combined with Catholic practices. Celebrations can take place over several days, and it is traditional to visit cemeteries where loved ones are buried and to prepare an altar at home. Altars usually contain a range of objects including flowers (particularly cempasúchiles, or marigolds), the favourite food of the departed loved one, candles, objects belonging to the departed, photos and decorated sugar skulls’. 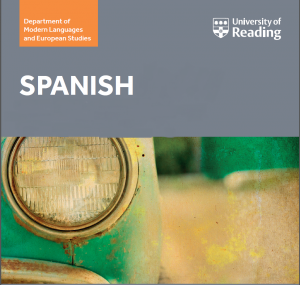 If Halloween, pumpkins and trick-or-treating are becoming more popular, the countries whose cultures and languages we study in the Department of Modern Languages and European Studies also have their own fascinating traditions! We are very pleased to announce that we have launched a Single Honours degree in Spanish and Latin American Studies, starting from September 2017! Immerse yourself in the diversity of the Spanish-speaking world by taking modules in language, culture, history and society that reflect the cultures of Spain and Latin America. You will have the opportunity to study with a dynamic team of staff who are internationally-recognised experts in their fields, and to gain a deep understanding of the Spanish-speaking world today. You will be able to apply for this course to start in September 2017. 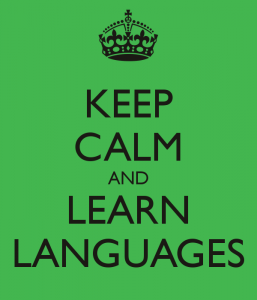 For more information visit our website or email languages@reading.ac.uk. In a globalised world we are confronted with an increasingly diverse mix of languages and cultures, bringing new challenges to language professions. 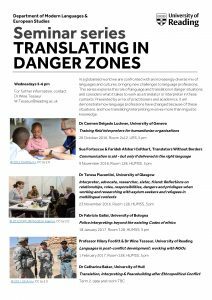 This series explores the role of language and translation in danger situations, and considers what it takes to work as a translator or interpreter in these contexts. Presented by a mix of practitioners and academics, it will demonstrate how language professions have changed because of these situations, and how translating/interpreting involves more than linguistic knowledge. CHECK OUR FACEBOOK PAGE FOR FULL PROGRAMME AND MORE DETAILS. Looking for extra guidance on your studies? To all students of Modern Languages and European Studies! 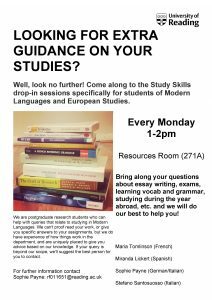 The department is offering weekly drop-in sessions for study skills advice specific to undergraduate students (all years) of MLES, run by the department’s study skills advisers. Do you have questions or worries about making the transition to university life, writing or structuring essays, building vocabulary, grammar, exam technique, note taking, time management, etc…? Come along to our sessions when we will be available to answer your questions. We can’t proofread your work, or give you specific answers to your assignments, but we do have experience of how things work in the department, and are uniquely placed to give you advice based on our knowledge as successful postgraduate students. If your query is beyond our scope, we’ll suggest the best person for you to contact. These sessions will take place on Mondays 1-2pm in HumSS 274A, the Resources Room. It is not compulsory to attend all sessions; come as and when you have a query.